Designed to replace those grotty paper OEM speakers these will work well from your high power headunit and great from an amp. 3-Way design produces crisp accurate sound, an excellent upgrade from stock speakers or replacement for broken ones. 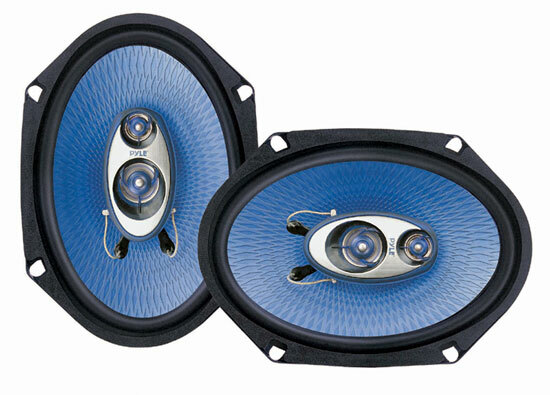 Amp Requirements: These speakers are best amped on a traditional 2 Channel amplifier or run from your high power headunit. One Pair 6'' x 8'' Three-Way Triaxial Speaker Systems | Power Handling: 180 Watts Rms - 360 Watts Max | Non-fatiguing Butyl Rubber Surround | 1'' High Temperature ASV Voice Coil | Standard 6'' x 8'' Size Fits OEM Locations | Blue Poly Injection Cone | 40 oz Magnet Structure | 1'' Neodymium Film Dome Midrange | 3-4'' Piezo Tweeter | Impedance: 4 Ohm | Sensitivity: 91 Db | Frequency Response: 70Hz - 20Khz | Includes Grills, Wires And Mounting Hardware | Mounting Depth: 2.35'' | Sold as : Pair | Weight :4.68 lbs.